Regular readers of Sound On Sound will know that it's pretty rare that I 'gush' with praise for a product, but one such highlight (way back in November 1997) was the original DACS Clarity MicAmp. I believe I said it was "simply stunning” and, 15 years on, I still stand by that assessment. The lower-priced competition may have caught up somewhat, in technical terms, but the Clarity MicAmp (now in Mk2 form) is still a standard bearer for fantastically transparent and quiet mic preamps — and it's British, which is nice! So why the new review? Well, DACS reformatted this classic preamp in 2011 to fit the API 500 series 'Lunchbox' modular format and I thought it was about time we checked it out. 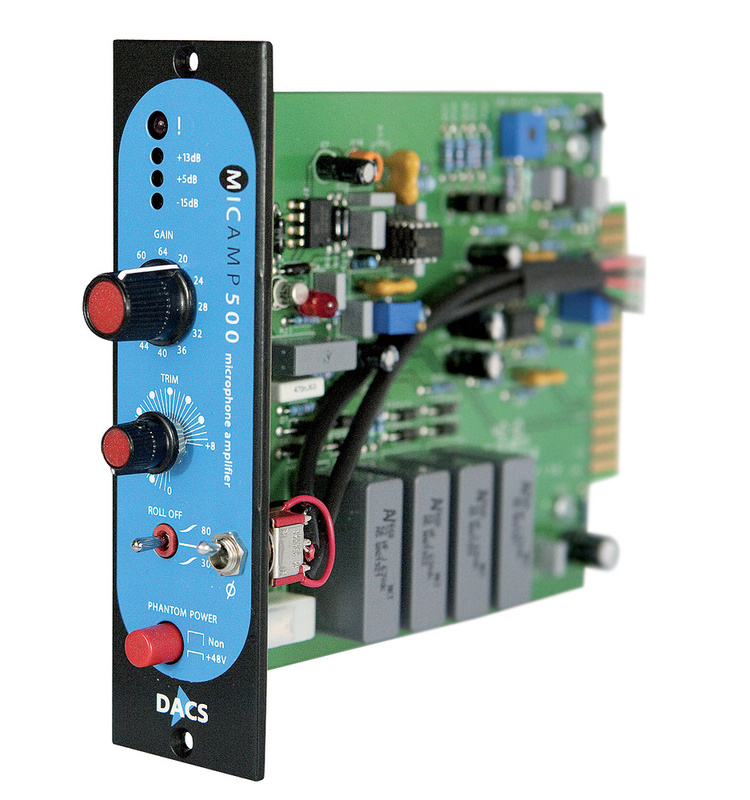 The DACS MicAmp 500 is, obviously, a single-channel preamp that relies on the 'Lunchbox' power supply rather than having its own, but the audio circuitry is virtually identical to the standard rack-mounting Clarity MicAmp 2, and the performance is identical. A welcome reduction in cost means that a pair of MicAmp 500 preamps works out roughly 25 percent less expensive than the two-channel Clarity MicAmp 2 — although that assumes you already have a Lunchbox frame with two spare slots, of course. The front-panel controls are the same as the full-size preamp, with a coarse gain switch (spanning 20 to 64 dB, in 4dB increments) and a continuous trim knob providing a further +8dB of gain. Toggle switches flip the output polarity and introduce a second-order high-pass filter (turning over at either 80 or 30Hz). The final control is a large red push-button that enables 48V phantom power. Metering is provided by a column of four LEDs which illuminate above -15dB (green), +5dB (yellow) +13dB (red), and when overloaded (large red!). The only significant difference between the rackmount and Lunchbox variants of the Clarity MicAmp is that the former is equipped with two sets of XLR inputs: one with permanently present phantom power, and one without. The latter not only ensures peace of mind for ribbon mic users, but also provides genuine input DC-coupling with no LF phase shift. The I/O facilities of the standard Lunchbox chassis preclude that second input option, but DACS have retained the DC-coupling mode in the MicAmp 500 by arranging the phantom power push-button to also bypass the (huge, polyester) input decoupling capacitors that are needed to protect the input stage from the phantom power supply. Build quality is superb, with the same distinctive stacked trio of SSM 2220 chips (which contain pairs of matched transistors forming the low-noise front-end gain stage), and the technical specifications are exemplary — particularly the extremely low distortion and noise figures. More importantly, the sound quality is still stunning. Highly recommended.